I know that anyone that watches ‘The Apprentice’ is not doing so for an insight into how a modern business is run but hearing the words ‘You’re Fired’ frequently bellowed through an office door couldn’t be further from my own experience. It represents a clichéd and caricatured view of management that I last saw to ‘comedic’ effect in Terry and June a 70’s BBC Sitcom. I am sure it is a style that exists but hopefully in a diminishing minority of organisations that haven’t found a way to deal with the bullying and haranguing of greying and dysfunctional dinosaurs. I was born in the 60’s which you have probably already worked out given the reference to Terry Scott and June Whitfield. I don’t recall being consulted by my parents on family decisions too often. Loving and supportive as they were, they were part of a generation that didn’t ask what kind of party we wanted, what cut of jeans we preferred or which destination we preferred for a day out. Of course their choices were far narrower but this was the generation of parents that pre-dated Parenting magazine let alone Parenting.com. Compare this with the generation entering the workforce today. Most have been involved in choices that affect them, carefully consulted in family decisions. Some, including those like Montessori educated Google founders, Larry Page and Sergey Brin have taken their progressive education and created progressive and hugely successful organisational cultures. The connection with Alan Sugar’s pantomime boss and the future of BI is this. The purpose of BI is to make better decisions. 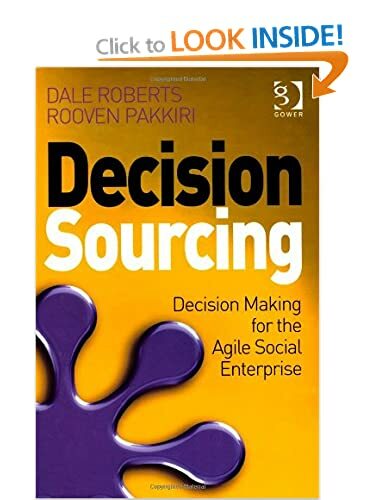 Those decisions, two decades ago, used to be made by one person (and in the main it was a man) Increasingly those decisions are made by teams, peer groups, special interest groups and the staff that are impacted by it. The drivers for the need for increasing collaboration in decision making are largely cultural. This includes the small matter of a whole generation entering the workforce that expect to be consulted and who are sociologically predisposed to sharing responsibility for the outcomes of those decisions. This means growing engagement in successful outcomes in organisations from a much broader group. Until very recently, this was just too difficult to do. The cultural implications aside, how do you poll groups, get their input, collate views, share opinions and establish any kind of consensus without committee’s, sub-committees and employee councils? How to you distribute the information, the hard numbers, that are needed to make a decision that aligns the needs of the business, it’s stakeholders with the needs of those that participate in the business as employees and partners? Social business tools and their convergence with BI are an enabler. They have made collaboration in decision making possible. The opportunity is an engaged and an informed workforce that can positively participate in the decision making process. Even if the individual did not support the outcome, they will know that their voice was heard. If an engaged workforce sounds ‘fluffy’ then ask yourself what’s your organisations largest cost? It isn’t usually paperclips. Estimates vary but some suggest that knowledge workers will account for 80% of the cost in the US labour force in 2012. If 80% of costs were in a machine would we be content on it idling, running at 25% capacity which some HR studies suggest is the current average level of engagement? I doubt it. So the manager of yore, jealously keeping information to themselves so that they can exercise power and control and ultimately make autonomous decisions without offering or taking counsel… You’re Fired.